It’s less than 7 weeks until the International Dairy Show takes place in Chicago (September 15 to 18). Today’s blog sponsor—Parker Products—will be exhibiting at booth 8416. Dairy dessert—frozen and refrigerated—inclusions are always a big part of the Dairy Show. Parker will be showcasing its extensive range of flavorful inclusions that can be customized by color, flavor, size and texture. For more information, link HERE. But guess what? We all still love ice cream! But as with everything else, today’s consumers want more from their sweet treats—have it be ice cream, pudding parfait or even decadent yogurt. 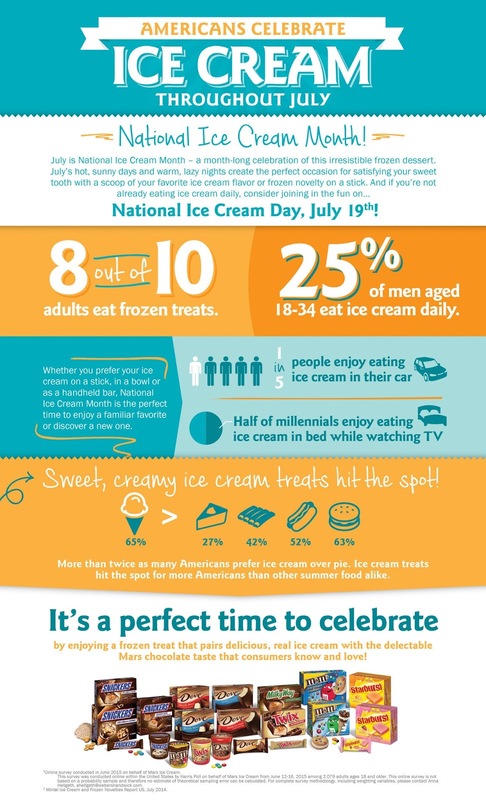 According to a new online survey from Mars Ice Cream, conducted on their behalf by Harris Poll in June 2015 among more than 2,000 U.S. adults, two out of three (65%) Americans say ice cream is among their favorite food to eat during the summer. Millennials, more than any other age group (OPPORTUNITY!!! ), say ice cream is their favorite summer food. Americans are more than twice as likely to name ice cream (65%) over pie (27%). And sweet, creamy ice cream treats hit the spot for more Americans than summer’s savory standbys of burgers (63%), hot dogs/brats (52%) and ribs (45%). Product development requires such out-of-the-box thinking. According to the keynote address given by futurist Mike Walsh at the recent IFT15: Where Science Feeds Innovation, the most successful food producers and manufacturers in the next decade will be the ones who harness science and technology to meet the demands of the first fully digital generation as they become adults. Walsh said that age group is of particular interest because they were born in 2007, the same year the iPhone was introduced. They are the first generation to be connected from birth, so they are growing up with a much different outlook on shopping, cooking and eating than other generations. They will expect products that are customized, readily available and—as already apparently on Instagram—look good enough to be photographed and shared on social media. The way to keep consumers—8-year olds, Millennials and aging Baby Boomers--interested in anything packaged and sold at retail is to continually jazz the products up with on-trend accessories. Remember when kiwi-strawberry was the “it” fruit flavor? Not too long ago it was pomegranate, followed by acai. Now we see accessories such as chia and quinoa dressing up everything from nutrition bars to refrigerated yogurt. All types of nuts, coated and flavored, chopped or slivered, as well as candies, crunchies and clusters can add life to the sweet treats. Here are more than a dozen innovative examples. This product is a few years old but worth revisiting, as the concept presents a great deal of opportunity, especially around the holidays. From Ambach in Germany, this limited-edition Tiramisu Kaffee Eiscreme (starting from the bottom up) features a layer of tiramisu-flavored ice cream, lady finger biscuits, tiramisu-flavored sauce, coffee-flavored ice cream and cocoa-covered cake pieces. This spectacular creation is finished with a drizzle of marsala wine. What really makes this product standout is the clear plastic container—showing the consumer exactly what’s inside—along with the decorative cardboard wrap that showcases a very festive bow, positioning the dessert as the perfect hostess gift for holiday parties. Ice cream cakes are another dessert-sharing opportunity for the communal-eating Millennial demographic. 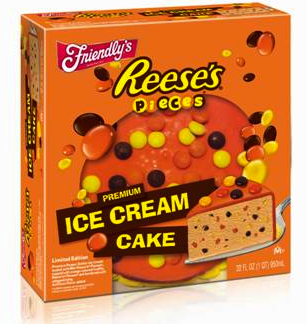 Friendly’s Ice Cream recently teamed up with The Hershey Company to introduce a new rich and decadent Reese’s Pieces Ice Cream Cake. Handmade at Friendly’s creamery in Wilbraham, MA, the cake boasts rich peanut butter ice cream loaded with mini Reese’s Pieces candies, Reese’s Pieces topping, and a freshly whipped icing border. The 32-ounce cake serves approximately eight guests and retails for $11.99 to $12.99. Kemps uses clear packaging to showcase the goodies packed into its line of Kemps Frozen Yogurt Shop. 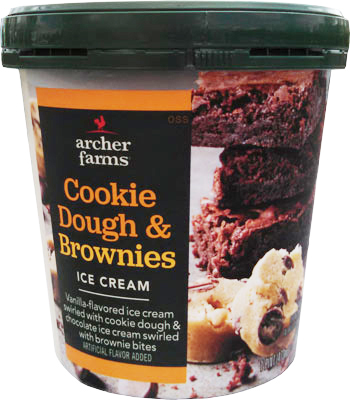 The 30-ounce plastic tubs come in four varieties: Cookies & Cream, Peanut Butter Cup, Raspberry & Chocolate and Vanilla Salted Caramel. Retail giant Target Corp., is in constant flux with its frozen dessert offerings, most likely a strategy to keep consumers curious and buying the private-label Archer Farms products. Now being sold in pints, the ice cream line includes treats such as Banana Almond Caramel (banana-flavored ice cream with almonds and a caramel swirl), Coffee Toffee Crunch (coffee-flavored ice cream with toffee chunks), German Chocolate Cake (chocolate cake-flavored ice cream with coconut caramel swirl and chocolate-flavored bits) and Strawberry Blondie (strawberry ice cream with strawberries and blondie brownie pieces). 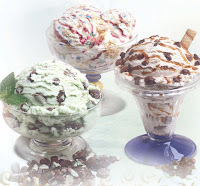 There are also gelato pints in offerings such as Amaretto Cherry (amaretto gelato with a cherry-flavored swirl and cherry chunks), Salted Caramel (caramel gelato with salted caramel swirl and a hint of sea salt) and Triple Chocolate (chocolate gelato with a chocolaty swirl and white chocolate flavored chunks). Millennials want their food to make a difference, so leave it to Ben & Jerry’s to give them what they want. With the Paris Climate Summit looming in December of 2015, Ben & Jerry’s is meeting the issue of climate change head on with a global campaign to activate fans and citizens around the world. 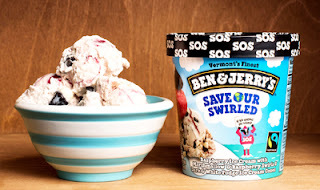 And what would a Ben & Jerry’s activism campaign be without a chunky, swirly, euphoric flavor of its own? Enter the new addition to the lineup: Save Our Swirled. With a bed of raspberry ice cream, swirled with rivers of marshmallow and raspberry, and white and dark fudge cone-shaped chunks, raising consciousness never tasted so good. The company continues to grow its Core ice cream line, which originally debuted in 2002 and was reintroduced to U.S. consumers in 2014. The concept includes a core center down the middle of each pint of ice cream. The flavor is said to complement the super-premium ice cream flavors on either side of the core. The most recent addition is Boom Chocolatta! This flavor features mocha and caramel ice creams with chocolate cookies and fudge flakes all surrounding a chocolate cookie core. It joins other varieties such as Hazed & Confused (chocolate and hazelnut ice creams with fudge chips and a hazelnut fudge core), Peanut Butter Fudge (chocolate and peanut butter ice creams with mini peanut butter cups and a peanut butter fudge core), Salted Caramel (sweet cream ice cream with blonde brownies and a salted caramel core) and That’s My Jam (chocolate and raspberry ice creams with fudge chips and a thick raspberry jam core). So who comes up with all these out-of-the box frozen dessert concepts? It’s not Ben or Jerry. Link HERE to read more about the inclusion-loving Flavor Guru who dreams up some of the most amazing flavor creations. 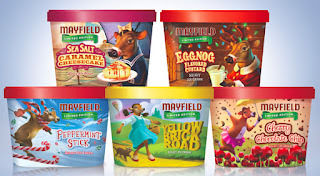 This season, Mayfield Dairy enlisted Maggie the Cow as its Flavorologist. “Maggie the Cow has a long history with Mayfield Dairy, and she has always been one of our leading experts in finding the delicious flavors that we all love to eat throughout the year,” says Scottie Mayfield, president emeritus of Mayfield Dairy Farms. The company has also changed the packaging design for its seasonal ice creams to share a small piece of the various adventures Maggie experienced while researching and finding these creative flavors. The five 2015 seasonal flavors are: Cherry Chocolate Chip Ice Cream, Eggnog Flavored Custard, Peppermint Stick Ice Cream, Sea Salt Caramel Cheesecake Ice Cream and Yellow Brick Road Ice Cream. 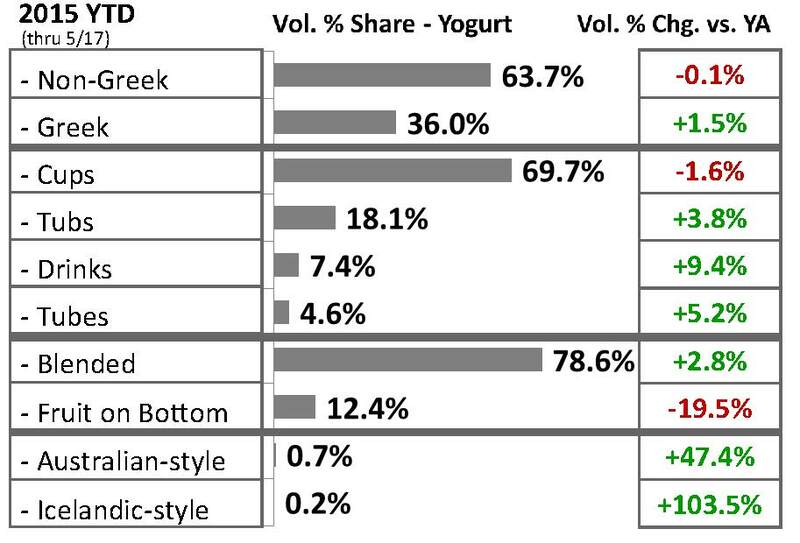 The refrigerated dairy dessert category remains very underdeveloped in the U.S. This is not the case in many Europeans markets, where entire aisles are dedicated to everything from mousse to pudding to fromage frais. Vanilla, Lemon, Keylime Pie and more. In the Netherlands, Melkan has developed a line of custards for children. Each single-serve cup comes with a dome of candied inclusions. This concept can be expanded to products designed for adult palates, including the emerging category of sweet with heat. Think glazed pecans bits with hints of brown sugar and cayenne pepper. 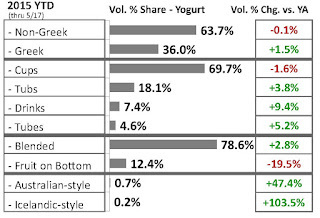 Lastly, Chobani continues to show consumers that Greek yogurt makes the perfect dessert. 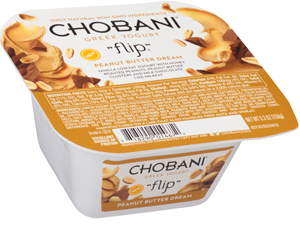 The brand recently introduced three new Chobani Flip products as part of its largest portfolio expansion to date, building on the success of offering better-for-you options throughout the day. New offerings include: Coffee Break Bliss (coffee-flavored low-fat yogurt with biscotti pieces and chocolate), Limited Batch Strawberry Summer Crisp (strawberry-flavored low-fat yogurt paired with golden graham crackers and white chocolate) and Peanut Butter Dream (vanilla-flavored yogurt with a mix of honey-roasted peanuts and peanut butter clusters). P.S. Have you heard about the opportunity in delivering probiotics via dairy foods? It’s less than 8 weeks until the International Dairy Show takes place in Chicago (September 15 to 18). Today’s blog sponsor—DDW “The Color House”—will be exhibiting at booth 8334. Natural colors will be a focal point at the show. They were two weeks ago at the annual meeting of the Institute of Food Technologists, which was also in Chicago. 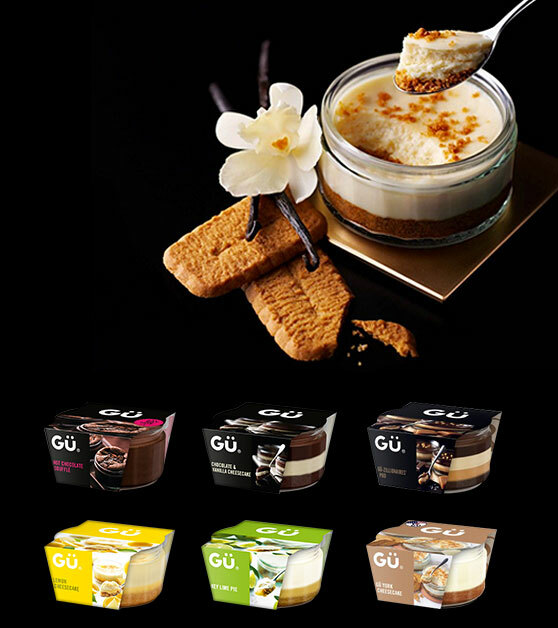 DDW showcased its extensive range of exempt-from-certification colors in all types of dairy foods, including cheese, flavored milk, ice cream and yogurt. Link HERE for more information on their innovations. Minions…not since Barney the Purple Dinosaur have I found another kids’ character so annoying. Fictionally evolving from single-celled yellow organisms at the dawn of time, Minions are said to live to serve the biggest and “baddest” villain. Frankly, I believe they are designed to drive adult humans crazy as they are EVERYWHERE these days. Link HERE to view the movie trailer. It will make you giggle and there’s actually a food (banana) connection, so your boss should not mind! There’s something to admire about the Minions. That is their determination, regardless of how questionable their pursuit might be. This same type of determination is invading the food formulating space in the form of no-no lists. It, too, is questionable, but unfortunately, unavoidable. 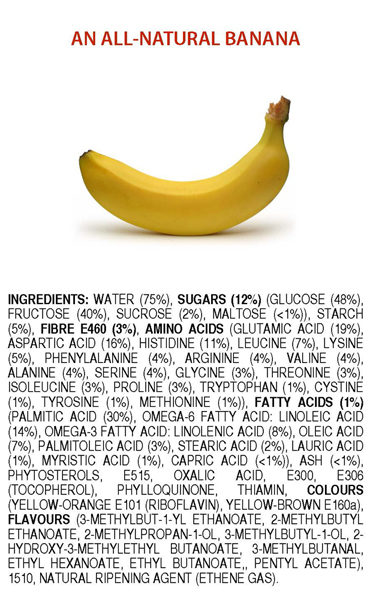 No-no lists are inventories of unacceptable food ingredients. These lists are not only here to stay, they are getting more personal. It started with Whole Foods Market. Since the beginning of the year, foodservice and food manufacturers have joined in. Whole Foods’ list can be found HERE. To read Panera’s no-no list, link HERE. The caramel color controversy is actually quite amusing while at the same time annoying, much like Minions. You can read about it in an article I wrote for Food Business News by linking HERE. Interestingly, caramel color is the single most used food coloring in the world. Because it is exempt from certification, by default, many consider it a natural color. Internationally the FAO/WHO Joint Expert Committee on Food Additives divided caramel color into four classes depending on the food-grade reactants used during manufacturing. All four classes are a dark brown material produced during a carefully controlled heat treatment of sugar. In most beverage applications that can benefit from some brown color, Class IV caramel color seems to work best. In ready-to-drink iced tea applications, Class II and Class IV caramel colors are typically used because their negative ionic charge reacts well with the tannins produced from the tea leaves. Chocolate milk, in particular chocolate milk sold through the National School Lunch Program, is often colored with Class IV caramel color. This helps keep costs down by reducing cocoa, which is more expensive than caramel coloring, while still providing a rich, deep brown flavored milk. The Class IV helps achieve a uniform chocolate look without settling. The same is true in ready-to-drink coffee-milk beverages. All four classes are simply declared as “caramel color” on ingredient statements. “Since all four classes are considered safe by FDA, the general consensus is that there is no reason to differentiate between the different classes on U.S. food labels,” says Ms. Guild. FDA does not believe that any caramel color poses any potential danger as a food ingredient. Read more HERE. However, in response to the Prop 65 listing, new Class III and Class IV caramel colors have been developed with low 4-MeI levels. Still, Panera says no. They also say no to Class II caramels. Not because they contain 4-Mel, rather because this class of caramel is known as “Caustic Sulfite Process Caramel Color.” The term “caustic” is the concern. Have the folks at Panera checked out the composition of a banana? It might actually be part Minion! Confusing? Crazy? This is just the beginning of the chaos. It’s as if the developers of these no-no lists are seeking out what they believe is the biggest and “baddest” ingredient, and adding it to their list to be one up on the others. With back to school in the air, it’s likely this chaos will carry over to the cafeteria. Although the U.S. public school system does not have a no-no list, per se, it does have guidelines and restrictions as to the composition of foods and beverages that can be served or sold to students. I am sure others around the world have similar procedures in place. Whereas Minions want to serve villains, these determined adults want to be heroes, to make a difference, to make a change, often without sound science. 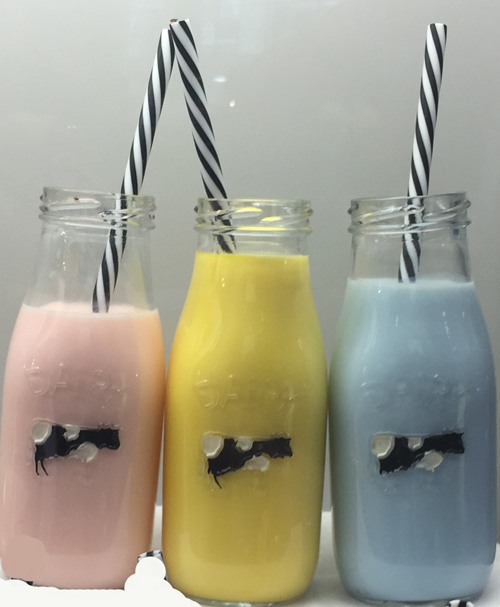 Consumers expect dairy to be free of anything artificial, including colors. (See graph.) Innova data show that more than 20% of U.S. products tracked in 2014 featured a clean-label positioning, up from 17% in 2013. 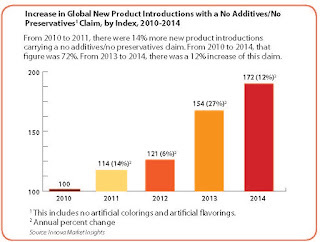 When it comes to new product introductions, in 2014, there were 72% more new product introductions carrying a no additives/no preservatives claim than in 2010. 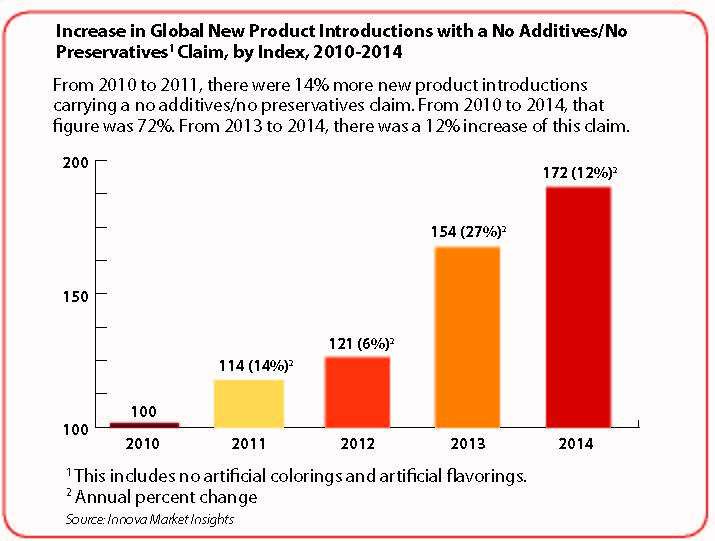 In other words, the majority of new product introductions feature a clean-label position. Further, many established brands are cleaning up their ingredient statements. All dairy foods can be colored naturally. 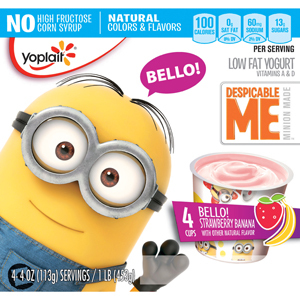 Yoplait Minions yogurts are colored with “vegetable juice.” The brand’s three limited-edition summer flavors are as well. Yoplait Original with 25% less sugar comes in a Rainbow Sherbet variety that uses “beet juice concentrate and paprika extract” to simulate the popular frozen treat. 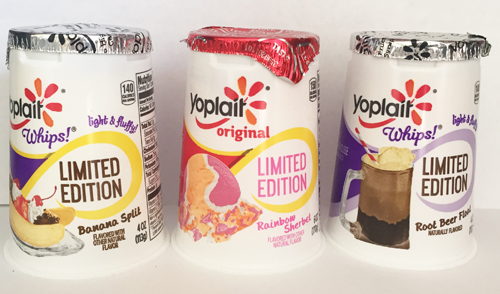 Yoplait Whips has two limited-edition flavors this summer. Banana Split is colored with turmeric extract and Root Beer Float uses caramel color. 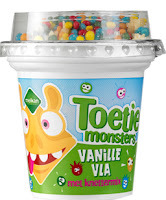 I bought all three flavors yesterday and plan to enjoy this weekend in the sunshine…that is, after I take my younger son to see the Minions…his request while his big brother is away at camp. It’s less than 9 weeks until the International Dairy Show takes place in Chicago (September 15 to 18). Milk proteins will be a focal point at the show. They were this past week at the annual meeting of the Institute of Food Technologists, which was also in Chicago. Today’s blog sponsor—Ingredia—exhibited at IFT and showcased its milk protein ingredients in numerous dairy applications, including a Greek-style yogurt dip, a quark-based cheesecake dessert and an extra-thick and satiating fruit smoothie. Link HERE for more information on their innovations. According to the 2015 Food and Health Survey from the International Food Information Council Foundation, Washington, D.C., more than half (54%) of consumers are trying to get a certain amount or as much as possible protein in their daily diet. This complements the report Proteins--Classic, Alternative and Exotic Sources: Culinary Trend Tracking Series from Packaged Facts, Rockville, Md., where 62% of consumers agree they are “making a point of getting enough protein” from the foods and beverages they consume. To read more about formulating beverages with protein ingredients, link HERE to an article I recently wrote on this topic for Food Business News. The fact is, protein is currently flagged on products in every aisle of the supermarket. Protein is “the” nutrient of the decade. Some say it’s just a trend or fad and will go away soon. Others believe this is the beginning of a new approach to healthy eating. All types of proteins—from algae to dairy to pulses--are part of this approach. It makes sense to put dairy proteins back into dairy foods. Look at these 10 innovations that use dairy proteins to not only boost protein content, but also contribute milky notes, create a smooth and creamy mouthfeel, and allow for a clean-label positioning. After all, “milk protein” and similar declarations are very label friendly. To read a recent blog on dairy proteins 101, link HERE. New Campina Vifit Drinking Yogurt from The Netherlands-based dairy processor comes in two varieties: Blackberry and Raspberry. The addition of milk protein to the yogurt base delivers 5.2 grams of protein per 100-milliliter serving. 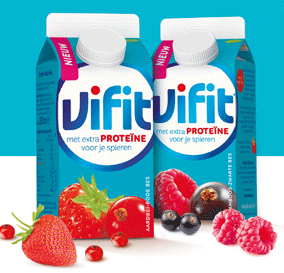 This is more than two-thirds additional protein than regular Vifit drinks. Vifit is made from freely roaming pastured Dutch cows that are outdoors for at least 120 days per year, for an average of six hours per day. The fermented beverage contains 0.8% fat and retails in a 330-milliliter bottle. PepsiCo continues to show consumers that it is so much more than a marketer of sugar-laden carbonated soft drinks. Like many beverage manufacturers, PepsiCo is packing in protein wherever possible. Over the years Gatorade has dabbled in various protein formulations but has always stayed true to its clear, fruit-flavored format. That’s changed. Gatorade Recover Protein Shake is a creamy beverage loaded with 20 grams of dairy proteins (from milk protein concentrate and whey protein concentrate) in every 11.2-ounce bottle. Even coffee now comes with protein. In March, Starbucks Doubleshot Coffee & Protein Beverage debuted in three varieties: Coffee, Dark Chocolate and Vanilla Bean. Sold in sleek 11-fluid-ounce cans, the drinks start with a base of brewed Starbucks coffee to which four dairy ingredients are added (reduced-fat milk, skim milk, milk protein concentrate and calcium caseinate). This combination provides 20 grams of protein per can. What’s next? Maybe the time is right for Pepsi Protein, a nod to the Pepsi and milk concoction made famous by the Laverne & Shirley comedy. 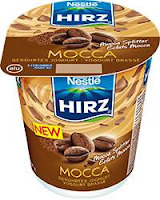 In Europe, in particular Switzerland, its global headquarters, Nestlé is a much bigger player in dairy product innovations than it is in the States. 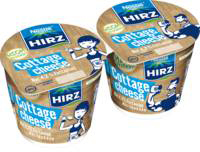 New Nestlé Hirz Hüttenkäse, a single-serve cottage cheese product, targets health-and weight-conscious female consumers through its package graphics and marking lingo. Each 115-gram cottage cheese container provides 13.7 grams of protein thanks to the addition of milk protein. Calories are 120 and fat content is just under 5 grams. The brand also has a new high-protein indulgent yogurt line. The three varieties—Caramel, Chocolat and Mocca—come in 180-gram cups. Whole milk, skim milk and milk proteins boost the protein content per serving to more than 7 grams. A serving also contains around 230 calories and more than 8 grams of fat. Whey protein gets the brand’s new drinkable yogurt product up to 6.25 grams of protein per 250-milliliter bottle. The drink comes in three varieties: Mango, Strawberry Cranberry and Wild Berry. 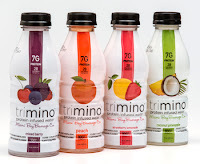 About six months ago, Miami Beverage Company introduced Trimino, a line of sugar-free, low-calorie functional protein waters. The clear beverages are powered by 7 grams of whey protein and 100% of the Recommended Daily Allowance of vitamin B complex. At only 28 calories per 16-ounce bottle, labels claim the product boosts metabolism and curves appetite. 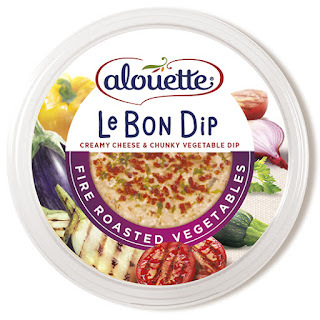 Combining French culinary know-how with unique flavors and a wholesome balance specially developed for the American palate, Alouette’s new Le Bon Dip and Le Petite Fromage bring a new dimension of taste and indulgence to everyday snacking. And milk protein concentrate and whey protein concentrate, respectively, make them sources of protein. According to recent studies, Americans snacking on any given day rose from 59% to 90% over the last 30 years, and in the same time frame, the average number of snacks eaten daily more than doubled. With the move away from processed and over-engineered foods, the demand for wholesome yet indulgent snacks has never been greater. Dairy proteins make them even more appealing! The new Le Bon Dip and Le Petite Fromage deliver craveable, balanced indulgence with natural ingredients and bold flavors. 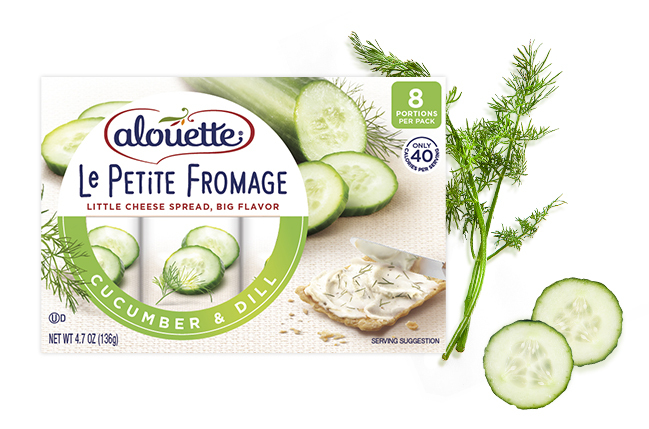 The new portioned, smart-snacking spread Le Petite Fromage is free of artificial ingredients--no additives, preservatives, artificial flavors or colors. Le Petite Fromage blends cheese and a touch of yogurt with vegetables picked at peak season and bold spices for a little cheese with big flavor. Whey protein concentrate enables each 17-gram portion (there’s eight to a pack) to contain 2 grams of protein. These individually packaged portions contain 40 calories and 3 grams of fat. They come in four varieties: Cucumber & Dill, Garden Salsa, Garlic & Herb and Parmesan & Basil. What’s for dessert? There’s a new protein-enriched frozen treat named Brio. The Daily Dose of Dairy first wrote about this product when it was in the concept stage and only available in select Chicago specialty stores. You can read about it HERE. 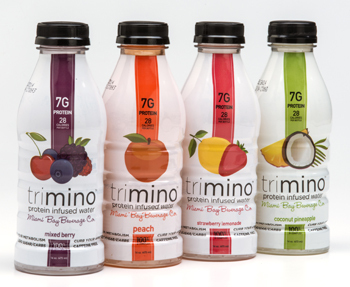 After a few tweaks in packaging and design, the company introduced Brio to the global marketplace at the Summer Fancy Foods Show. To achieve the perfect balance of delicious and healthy, Arnie’s twin brother and business partner Ron Koss led a team that included former Ben & Jerry’s flavor developers and noted dietitians and nutritionists. After 10 years of product development, testing at Cornell’s food labs, two patents and a published scientific study in Today’s Dietitian, the Koss brothers began commercial production of their revolutionary new ice cream in the summer of 2015. 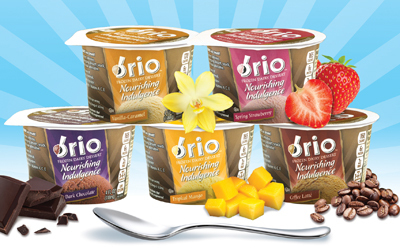 Brio has half the total fat of superpremium ice cream, 65% less saturated fat, 75% less cholesterol and approximately 25% fewer calories. The Koss brothers call it “ice cream with benefits” for the many nutritional advantages it offers. “Thanks to our natural sweetener blend, Brio is low glycemic and helps you avoid sugar spikes and crashes, good news for people who may be pre-diabetic or diabetic,” says Ron Koss. And thanks to the addition of whey protein concentrate, a half-cup serving is a good source of protein. “Brio provides 6 grams of protein, balanced Omega 3-6-9s, 2 grams of prebiotic fiber and is antioxidant rich, offering also an excellent source of calcium, magnesium and vitamin D,” says Ron Koss. Brio has only 160 to 170 calories per serving. Dairy/milk/whey proteins can make all dairy foods better dairy foods. It’s less than 10 weeks until the International Dairy Show takes place in Chicago (September 15 to 18). Today’s blog sponsor—Chr. Hansen—will be exhibiting at booth 7137. Chr. Hansen is also sponsoring the Daily Dose of Dairy Live! presentation on Wednesday, Sept. 16, from 10:00am to 10:30am on the show floor. The topic is Innovations in Yogurt and Cultured Dairy Foods. Please mark your calendar and plan to attend. Today’s blog highlights some of the trends you can expect to see showcased at the International Dairy Show. 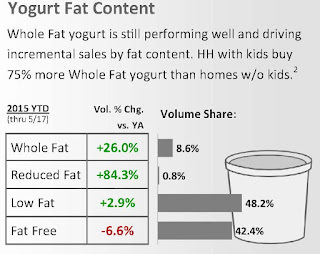 What’s driving volume sales growth across all sectors: whole milk formulations. Why? Because mouthfeel matters, and whole milk, fermented with premium cultures, produces a yogurt that is naturally creamy and delicious without the addition of thickeners or stabilizers. 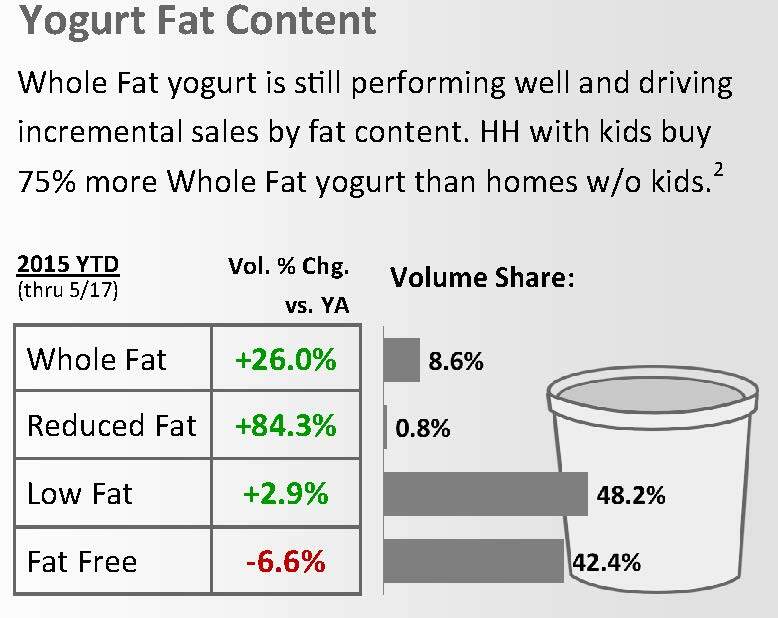 It’s the natural way to be clean label and apparently quite appealing to today’s consumers, as reflected in the IRI volume sales data showing whole milk yogurt is up 8.6% for the 52-week period ended May 17, 2015. Research supports that whole milk dairy can be part of a healthy, well-balanced diet. A study published in June 2015 by the American Journal of Clinical Nutrition reported that eating full-fat cheese and whole milk did not relate to weight gain or weight loss among healthy men and women. Similarly, a review of research published in the European Journal of Nutrition found that, in the majority of the studies evaluated, people who consumed more whole milk dairy products either weighed less or gained less weight over time. Researchers believe that this may be because whole milk dairy products, which contain more fat, might be more satisfying, meaning people might eat less of the richer version and this effect may also carry over into eating less in their overall diets. Embracing this information, siggi’s is launching a new line of whole milk skyr yogurt in five varieties—Plain, Vanilla, Strawberry & Rhubarb, Mixed Berries and Fig & Lemon Zest--with the last variety exclusive to Whole Foods Market. 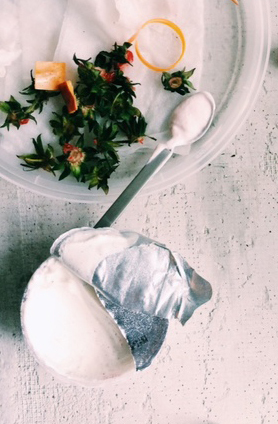 What is skyr? Pronounced “skeer,” skyr is the traditional yogurt of Iceland and until now, has always been nonfat. It is a strained yogurt that is extra thick and creamy and loaded with milk’s nutrients. Approximately four cups of milk go into the production of one cup of skyr, with the finished product containing two to three times the protein count of standard yogurt. The new 4% milkfat varieties of siggi’s Icelandic-style yogurt continue the brand’s tradition of simple ingredients and not a lot of sugar. Made with whole milk yogurt and a touch of cream for a richer taste experience than the 0% and 2% milkfat varieties, the yogurts contain more protein than sugar per serving, without using low-calorie sweeteners or sugar substitutes. Sold in 4.4-ounce containers, each serving contains 5 grams of fat along with 100 to 120 calories, 10 to 11 grams of protein and 3 to 8 grams of sugar, depending on variety. Siggi’s whole milk yogurt became available in U.S. grocery stores on July 1, 2015, and have a suggested retail price of $1.69. For more information, link HERE. The company also markets a unique drinkable yogurt that resembles traditional filmjölk in Sweden. Filmjölk is to Scandinavians what kefir is to Eastern Europeans and it can be enjoyed straight from the bottle or poured over fruit or granola. It is slow fermented using Lactococcus and Leuconostoc culture strains to give it a soft buttery flavor. It is also loaded with probiotic cultures, delivering one billion per serving. siggi’s Filmjölk comes in four flavors: blueberry, plain, raspberry and vanilla. The nonfat drinkable yogurt contains 8 grams of protein per 8-ounce serving, along with 100 to 120 calories, depending on variety. 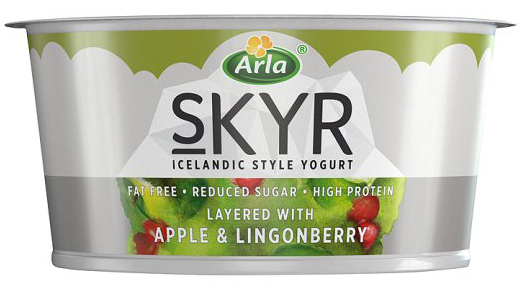 Arla Foods is launching Arla Skyr into the U.K. market as part of the company’s expansion into the yogurt category. The product comes in two sizes and multiple flavors. The 150-gram single-serve pots come in Apple & Lingonberry, Natural, Nordic Mixed Berry, Nordic Sour Cherry and Strawberry. There are also 450-gram multi-serve containers in Honey, Natural and Strawberry. Back in Denmark, its global headquarters, the company is currently responsible for around 50% of the market share of total skyr. 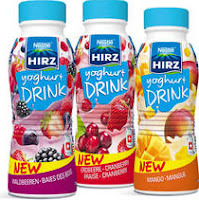 To continue to grow the category, Arla Foods identified an opportunity with a thinner, more drinkable format and introduced Cheasy skyr this past February. It is slightly lower in protein (2.6 grams less protein per 100 grams than regular skyr) with a smooth, easy-to-pour consistency. It contains no added sugars and comes in two varieties: Blueberry/Vanilla and Pomegranate/Raspberry. For more information, link HERE. 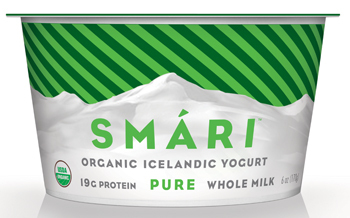 In the States, another skyr concept, Smari Yogurt, has gotten creamier with Grass-Fed Whole Milk Yogurt in Pure and Vanilla variants. The company has also added coconut and peach to its nonfat skyr line. For more information, link HERE. Technically a fresh cheese, quark is often consumed—and cooked with--in the same way as yogurt. 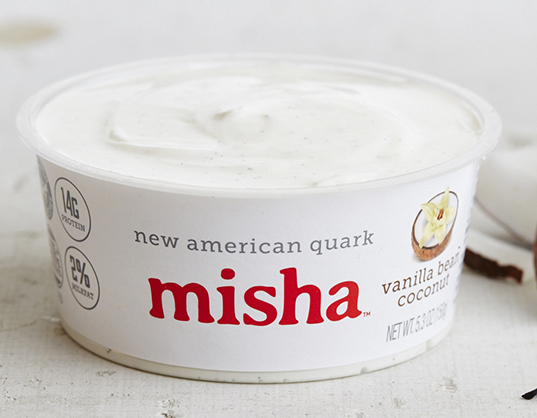 “misha -- new american quark,” is a not-tart, protein-packed spoonable cultured dairy product that is made with milk from grass-fed cows. 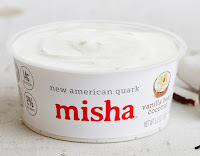 Much like skyr, four cups of milk goes into each cup of quark, with misha quark having up to 17 grams of protein per cup and 2% milkfat. To read more about misha, link HERE. Innovation is taking place in the frozen yogurt arena as well. 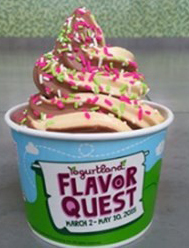 Earlier this year, Yogurtland introduced 10 limited-edition flavors for its third annual Flavor Question promotion that takes guests on a culinary journey around the world with flavors representing 10 countries. One of these flavors, Peanut Nougat with Almond Butter and Honey, is the company’s first cultured gelato offering and is made with whole milk for a creamier, more indulgent taste. All of Yogurtland’s flavors meet the National Yogurt Association Criteria for “live and active culture frozen yogurt.” Presently Yogurtland has 300 locations across the U.S., Australia, Guam, Thailand, Venezuela and Dubai. For more information, link HERE. The annual World Dairy Innovation Awards took place in Amsterdam as part of the ninth Global Dairy Congress at the end of June. The judging panel, which included myself, considered almost 220 entries from 30 countries in 18 categories. “We saw a fantastic range of products this year as innovation continues to ignite consumers’ growing interest in dairy,” said FoodBev Media’s Bill Bruce, coordinators and hosts of the contest. “We also saw an increased number of entrants from Asia and Africa representing the healthy dairy market now present in these regions. 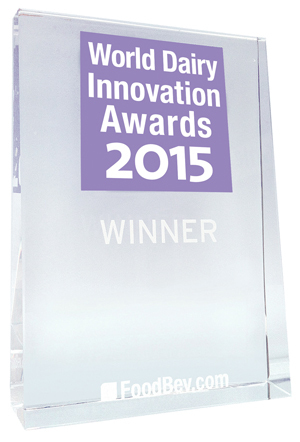 All entries will be featured in a special Awards Showcase magazine, which will be distributed with issue 62 of Dairy Innovation magazine and available as a digital edition. If you would like to subscribe to Dairy Innovation or receive a copy of the showcase magazine, link HERE. For a list of all the winners and finalists, link HERE. 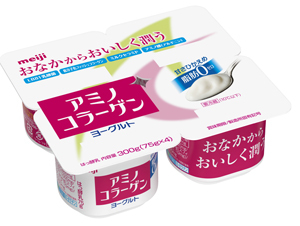 For Best Yogurt, the winner is Meiji Amino Collagen Yogurt from Meiji Co Ltd in Japan. 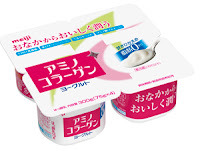 The yogurt combines Japan’s best-selling yogurt brand with Japan’s top-selling collagen supplement brand, providing this popular skin-care ingredient in a yogurt product. There were two finalists in the yogurt category. One was Vegetable Yoghurt from Australia’s Yummia Pty Ltd, which is a range of vegetable and fruit yogurts. Each 150-gram pot contains a half-serving of vegetables. 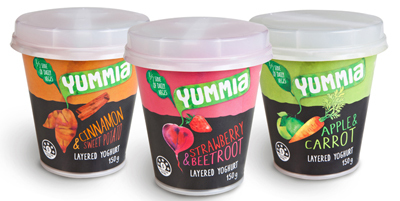 The layered yogurts come in three different varieties: Apple and Carrot, Strawberry and Beetroot, and Sweet Potato and Cinnamon. Each pot includes a spoon for added consumer convenience. 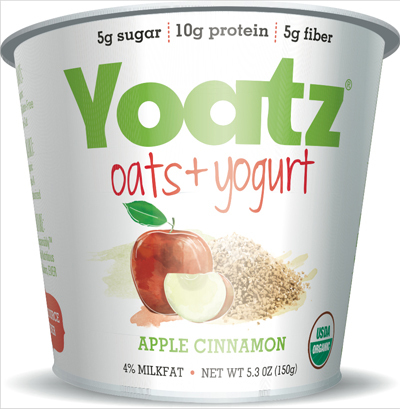 The other finalist--Yoatz Oats + Yogurt—is a range of single-serve cups of organic ready-to-eat oats, fruit and yogurt. The product line made its debut earlier this year as a nonfat product. You can read about it HERE. In spirit of science and innovation, as the annual meeting of the Institute of Food Technologists (IFT) kicks off this weekend in Chicago, here’s some news from Cal Poly. Researchers at the university have developed an improved process to extract protein from milk. The patent-pending process allows for fast and cost-effective extraction and produces a protein that will enable foods and snacks--including potato chips, corn chips and crisps--to be produced with enhanced protein content, protein from dairy! For more information, link HERE.